Speeding from a boat on the San Francisco Bay at dawn. It was two days after Thanksgiving, 2013, that I interviewed Steve Shirley near the Golden Gate Bridge and digitally filmed his Sevengill Shark tagging trip. A year later, here’s what I learned about making my short documentary. Up before dawn, with a crew of three men and a boy, we headed out of the Berkeley Marina in Steve’s boat into the San Francisco Bay. The medicated patches I had placed under my ear lobes to prevent seasickness had fallen off in the dark parking lot. “Oh well, here we go,” I thought. I held my breath and my camera steady as I filmed the rising sun with a big ol’ grin. Being the only female out there reminded me of ‘tomboy-self’ when I was nine, on a quail-hunting trip with my Dad, his hunting buddies, and my brother. Although it sort of felt like a test on whether I could keep up with the men, I was feeling good. Being an independent documentary filmmaker for my own National Geographic-like production was happening, as a result of my self-directed learning and effort. I’m not trying to sound like a braggart. I’m interested in promoting self-directed learning at Intrinsic Lifestyle and Intrinsic Lifestyle Productions. Making my film was my intellectual and creative outlet, my escape. Normally, my routine as a homeschooling parent and as a year-round swim team parent dominates my weekdays and weekends, in addition to housework, cooking, groceries, urban farming, and beekeeping. Then there’s my Mom, who lives next door to me with progressive MS; or helping/visiting my sister with stage four metastasized breast cancer peridodically. I’m not stating this for sympathy; nor am I complaining. The fact is: since I chose to stay at home and homeschool our children and to lead a family-centered lifestyle, caregiving has been my life. Now that two of our kids are adults, I have more time to pursue my interest in filmmaking. I’m ready. When you look at San Francisco by the bay, you don’t usually think about the five species of sharks swimming in the water nearby. I showed this dichotomy in my film. But it took a few adventures to find the right place to conduct my final interview with Steve. On weekends, I’d scout locations around the bay. My explorations were liberating. They reminded me of my college days at the University of Arizona in Tucson, when I’d enter abandoned adobes in the barrio viejo to take photographs. On bike rides, with my camera slung over my back, I’d stop and shoot b-roll video footage at Treasure Island, at the Piedmont cemetery; and by an Alameda shoreline. I was practicing using my new camera, a Sony RX10. I composed my shots to show the contrast of nature amidst an urban metropolis; a place where hundreds of thousands of people and industry thrive amidst sea birds, aquatic plants and sharks! To decide when to shoot more interview footage of Steve with the bay behind him, I consulted tidal and weather charts and studied the light on the water. As a ‘crew-in-one,’ I practiced setting up my tripod, camera, wireless mic, and lights at home. Later, I lugged all of it to various locations at Middle Shore Harbor in Oakland, where I had pre-marked the ground for my tripod and filmed Steve for our last interview. We also met at his home, where he answered many of the questions we’d discussed on the phone, in his office, and in his basement. 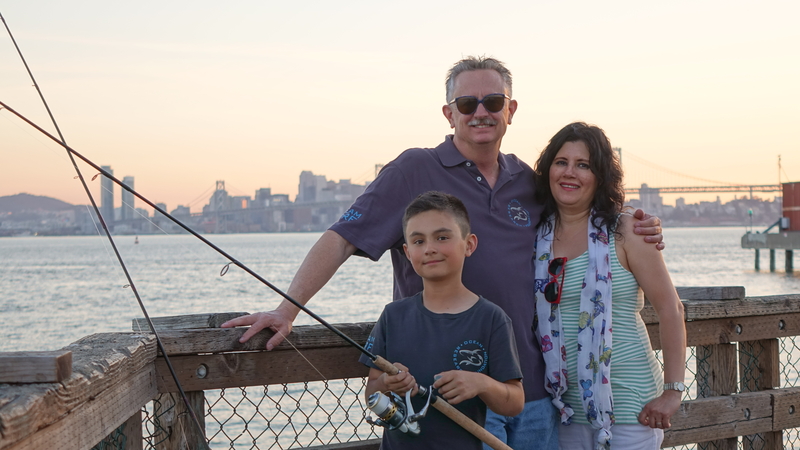 Steve Shirley, with his wife Lilia and their son, Gabe, at Middle Shore Harbor in Oakland, California. Steve requested that a song called, “Hook,” written and sung by San Francisco performer and photographer, Mike Gibbons, be in my film. I liked the melody and the words in the song were “catchy” but the first recording I had was poor. Steve paid for Mike to re-record it with a few other musicians and a professional sound engineer in a studio. I used “Hook” in the beginning and the end of my film. I also wove my son’s acoustic guitar recordings into the film to create a mood. When I thought I was done editing, I wanted to know where my film stood, professionally. I sought the help of an Academy Award Winning Sound Designer (who prefers to remain anonymous.) After twenty-five years, I cold-called him and reminded him who I was. I asked him if he’d take a look at my short doc and critique it. I met with him in his swank Presidio studio. I expected negative feedback from him. After all, in comparison to the feature film legends he’s worked for, I’m a complete amateur. I respected his talent. I knew that his perfectionism, along with the seventy-one feature films under his belt, got him where he’s at. So I sat on his couch mesmerized by his knowledge, his deep bass voice, and his willingness to help me out. His remarks were point on. Even though his criticisms were kind of deflating, I left energized and ready to remix the whole thing, three more times. Also, it was nice when he said that my film had a sweet sincerity about it that he hoped I’d maintain through additional editing. I think I learned the most from his process of reviewing the footage of a small sequence repeatedly. That made me aware of the rhythms; what made sense to be next; or, what was off or missing. In addition, I began listening to classical music, which helped me hear the patterns and the structure of a piece. Watching 1940s b&w films was also useful–interestingly, due to the lack of sounds in them. Very few sounds were used in early films and the lack of sounds made the scenes naked; and their absence made me aware of what was missing. Doing all that helped me mix an environment of sounds in my own film including, dialogue, ambience, sound effects, and music. Although I did all the mixing myself, alone at my workstation wearing my dorky white headphones, I credit the ‘coming together’ of my film to my “friend in the business”. I know I couldn’t have learned what he taught me in eight hours from a book, or in a class. I still have more to learn. The whole process was complicated but throughly engrossing. I’ve since started another short documentary. Throughout my project, the people who’ve helped humbled me. Interestingly, I’ve met and or followed many film professionals or independent filmmakers on Twitter. A documentary filmmaker, photographer, curator and professor from New York City, Ted Fisher, critiqued my film privately and emailed me comments. An Italian Visual Anthropologist teaching Ethnographic Documentary, Lorenzo Ferrarini, advised me about sound and distribution options. Cyrus from San Francisco, an Editor/Producer, helped me with FCPX 10.1 sound tips. As of late, I’m figuring out how to distribute my short doc. Based on advice from the three men above, I used Withoutabox and Film Freeway to enter festivals. I’ve also contacted Museum Professionals in Exhibit Design and Education for contacts at local science museums like the Monterey Bay Aquarium, California Academy of Science, and the Oakland Museum of CA to get my film screened there. But I think my best option for the most people to see it is on our local KQED station. With the threats our oceans face, there’s an inherent interest in marine life. Most people don’t know the role sharks play in the ecosystem or how threatened they are. Fisherman continue to catch and kill them as trophy’s. Right now in California, people may catch a Sevengill or Leopard Shark of any size, every day of the year. As Steve says in my film, “That’s just too much!” He’s hoping that his study, in partnership with the Monterey Bay Aquarium, will eventually lead to more shark regulations. There’s definitely a need for people to watch “Steve Shirley: Shark Tagger.” In my film, Steve guides viewers to understand and to care about Sevengill Sharks in the SF Bay. Good luck with your distribution so as many people as poss can see the film. Sounds like you have done a really good job and would like to see it from your descriptions. I used to teach a bit of media and film and also visited SF bay in 1999 and went on a whale watching trip. The only whale seen was in the bay by the bridge so the rough trip out to sea wasn’t appreciated! Get sea sick so like the idea of whatever it was behind your ears! Hi Navasolanature, I’m not much of a boat person but I love to swim! Thanks for your comment and I’m sorry it took me so long to respond. No problem. We don’t have wifi unless we go into town so am slow too! Kristin, this has been an epic project for you! I’m inspired and awed by how much you taught yourself, and how many people you reached out to and learned from. This is such a fantastic example of how, when people are doing something that truly interests them, *hard* work can be deeply fulfilling. It’s the kind of learning that every homeschooling parent should aspire to for their kids–and for themselves! –And you know, I credit you for getting me started pursuing my interests, as you were modeling that with your own writing pursuits. So thank you! I’d like to think that people can accomplish what they want, given the right mindset and the willingness to work through difficult patches.